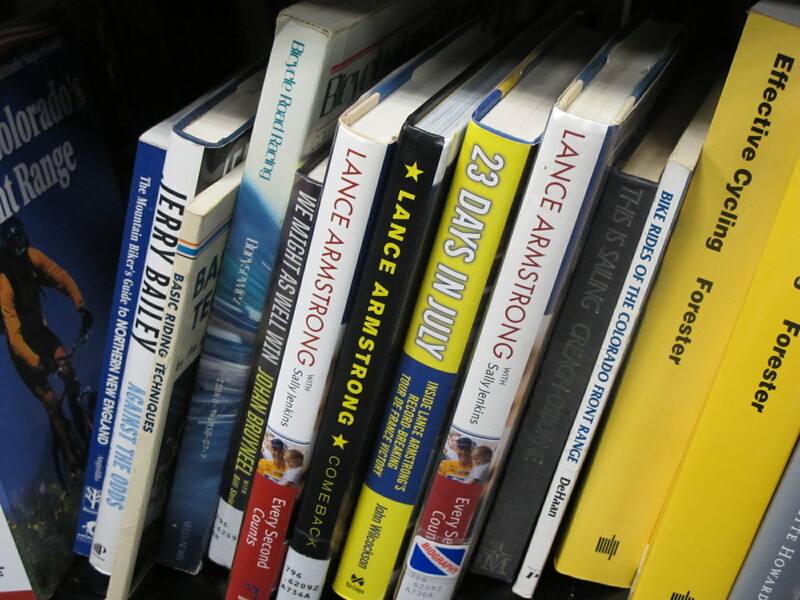 No shortage of Lanced books on sale at the Austin Public Library’s Recycled Reads store. Hardcovers: $2, paperback: $1. Cheap! [CNN’s Anderson] Cooper asked LeMond if Armstrong perpetrated the greatest fraud in sports history. Absolutely. Absolutely,” LeMond replied. “The greatest fraud was that, I mean, I know his physical capabilities. He is a top 30 at best. I mean, at best. No matter what. If he was clean, everybody was clean, he was top 30 at best. He is not capable …of the top five. “What do you think should happen to him now?” Cooper asked. “You think he should go to jail?” Cooper asked. “I do, yes,” said LeMond, who compared Armstrong to Bernie Madoff. Yeah, well, there was that, and that’s why we didn’t release it. It was not a promo job – there was quite a bit about how brutal he was with people and the allegations of doping – but, in the light of events, it was not a film that could be credible. As Lance once told me – because we had a conversation prior to Oprah when he was pondering how to come forward and I said, not nudging him: “Why don’t you just keep doing what you always do and fight?” He said “Well, the lie is no longer believable.” So there had come a moment when the lie was no longer believable. Taking a fresh look at the footage late last year, Gibney and producer Frank Marshall recognized that they had captured the incredible truth that had been “hiding in plain sight,” he said. “We realized that we had all of this stuff that we didn’t know was so important then, but was now important,” said Marshall. He finally returned the bronze medal from the 2000 Olympics. There’s that. Odd, too, I thought, was the comment on The Guardian’s site from author Malcolm Gladwell, defending Liestrong. Well, injecting yourself with substances that have been specifically banned by your sport’s governing body to give yourself an advantage, winning lots of races and making lots of money, lying about your use of these substance, and bullying people attempt to point out the truth – would that meet your definition of cheating? I think society has a fairly broad consensus on this one.